The High Ropes Challenge Course has been included on all our NLP certification courses since 1998 - 20 years of learning and exhiliration. It involves climbing trees and poles up to about 10 metres or 30 feet above the ground - for fun, for excitement, and because it's an excellent way to learn about yourself and your often un-tapped potential. On the High Ropes you have the opportunity to take part in what is, for many people, a pretty unfamiliar experience i.e. climbing trees in a forest! The learning points from the High Ropes session are many and we explore and discucs these during the High Ropes session and, in particular, in an extensive NLP-based review when we arrive back in the Lodge. The High Ropes session is exciting and fun - and can be a bit scary when you're actually climbing. The session is also an excellent opportunity to stretch yourself. And, because we always run the session on the last or penultimate day of a course, it's a great time to really stretch yourself - while you use your new NLP skills to prove to yourself that you can achieve more than you believe possible. You're standing in a pine wood. The ground is slightly springy because of decades of fallen pine needles. You and your friends from the course have kitted up with helmets and safety equipment. Now you are looking up at the tall straight Scott Pines among which the Ropes Course has been built. Most of the activities involve climbing the tree using the metal rungs embedded into it. You are completely safe from falling since you have a safety rope attached to your harness. Yet that doesn't quite register for most climbers - it's still scary. The highest point is about 10 metres or 30' above the ground. That's just over the height of two double-decker buses, stacked one on top of the other. 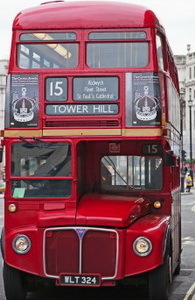 A Routemaster bus (see image) is 4.38 metres high. For most people the High Ropes session is initially quite scary; fear of heights is very widespread. Nothing is compulsory on our courses - especially on our outdoor sessions. You're in charge at all times. Nor is there any subtle 'peer pressure' - we've thought of that, too. A central principle which runs through everything we do is Challenge by Choice. - and how far you go with it. Not only do you choose but everyone else unquestioningly accepts and supports your choice. Simple. Pressure-free. 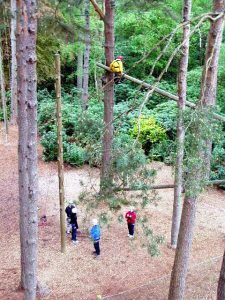 Why include the High Ropes in an NLP course? So why do it? Because it's fun - and because it may well provide you with enduring proof that there's a lot more to you than you thought there was! How do I deal with unfamiliar situations? Do I handle stress by being supportive of myself -- or by giving myself a hard time? To what extent do I allow my assumptions, about other people's expectations of me, to influence my performance? when other people are climbing do I support them -- or do I become so wrapped up in my own preparation from my own session that I ignore them? to what extent do I live within my Comfort zone -- and to what extent do I stay fresh by exploring the Stretch zone in my daily life? Which activities are included in NLP Core Skills? 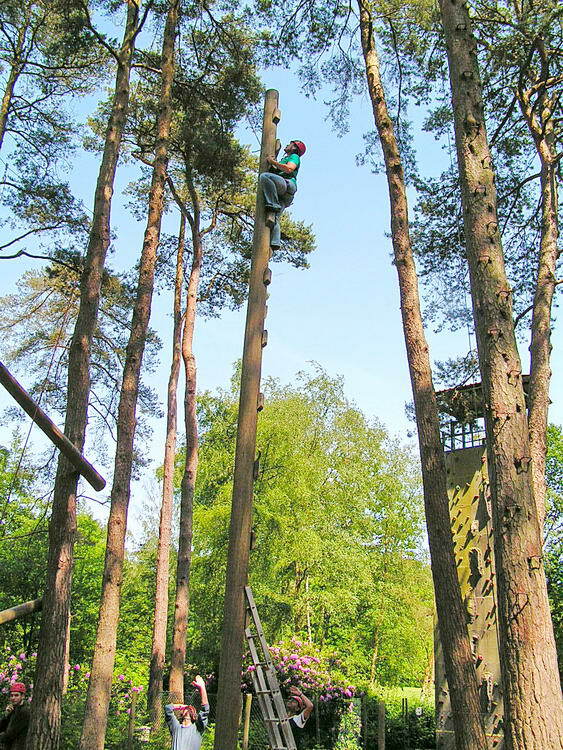 The High Catwalk is one of the activities we use on the High Ropes at NLP Core Skills - we also include a number of other activities which may include the Incline Logs, the Multi Vine, and the Trapeze Jump and sometimes the Crate Stack challenge. Which activities are included on a particular course will be influenced by weather, available time, safety (a particular activity may be withdrawn for safety inspection or maintenance). We aim to include High Ropes on every course but safety factors include the weather; winds above a certain strength and lightning make the High Ropes unsafe. Where possible we will aim re-schedule a cancelled session - we've only had to do this twice in 20 years.